An International Space Station school contact has been planned with participants at Tulsa Community College, NE Campus, Tulsa, OK on 01 July. The event is scheduled to begin at approximately 15:59 UTC. It is recommended that you start listening approximately 10 minutes before this time.The duration of the contact is approximately 9 minutes and 30 seconds. The contact will be direct between OR4ISS/RSØISS or RSØISS/OR4ISS and WD5AGO. The contact should be audible over the middle U.S and adjacent areas. Interested parties are invited to listen in on the 145.80 MHz downlink. The contact is expected to be conducted in English. TCC is Oklahoma's largest community college with more students and more degree earners than any other community college in the state. We offer students a choice of 235 associate degrees and certificate of completion programs of study. TCC students come from every walk of life, and our graduates work in all sectors of business and industry to help build a stronger, more diverse economy. Four campuses (Metro, NE, SE, and W) serve the Tulsa, Oklahoma area. If you're passionate about electronics, criminal justice, horticulture, engineering, computer networking, human services, fire emergency services, interpreter education or aviation science, "Northeast" is the campus for you. Located near Tulsa's industrial and aerospace hub, the campus is perfect if you're seeking a career in high-tech business or service-focused careers. Along with a strong educational curriculum, the campus is home to the Resource Center for the Deaf and Hard of Hearing, offering access to higher education for all segments of the population. The TCC Electronics club started in the early 1980's on the NE Campus which is where the Electronics and Engineering Technology classes are offered. Amateur Radio activities were added in 2000 (the year an instructor came on board as the only HAM operator), and we became an "ARRL" affiliated club in 2005. Now the TCC-ARC station consists of two towers for HF and VHF, along with two EME and Radio Astronomy arrays. What an amazing time was in the Oklahoma Section for Field Day this year! From Mooreland to Poteau and from Tulsa to Altus, the Section was alive with activity. The West Central Oklahoma Amateur Radio Club reported 18 hams and five visitors participated in their operation. Here are the numbers from N5OP. Ed, K5CRQ at the Tulsa Field Day operation. first EVER Field Day event! sent a photo of the Stillwater Field Day site. Check out Tagboard for other news about Field Day in Social Media. In addition to Eddie, K5EMS, Section Leadership visits were made by Conner, WX5CJK, Mark, N7XYO, Tom, WA9AFM,. Extra points were made possible by Mary, KE5LTA. Thanks to all hands who made light work. Stay hydrated! (not all of us are still spring chickens). Keep an eye on the rest of your group for signs and symptoms of exhaustion. I would be fitting to assign one of the elmers as a safety monitor especially during erecting antennas. I like to supervise the cooking! Give more than you get. This life and this hobby is more about giving than getting. Make a difference to someone else and you will look back on this weekend as a success. Thanks to Mark/AE5MH (SK) for these thoughts..
Do you practice the Incident Command System at your field day? Did you logistics section have enough fuel for the generator? If you have Field Day Photos please tag @arrl_OK on Twitter, add them on Facebook, or send them to the Public Information Coordinator. Spring 2015 issue of Radio Waves is now available. Debra Johnson, K1DMJ, ARRL Education Services Manager, asked me to share the following announcement with you about the newly published Spring 2015 issue of Radio Waves. This is the newsletter for ARRL registered instructors and teachers. We've just published our Spring 2015 issue of Radio Waves. here's the plan for Saturday visits. counting stops. Therefore, this is extremely subject to change. is to be made, it will be a phone call to the number listed there. clearer understanding to the issue. formalized or documented on our website. vehicles, and for group events involving multiple operations. radio activities on other users. antennas and/or other equipment outside the vehicle, or group events. questions. If you have any questions, feel free to let me know. ARES Manual has been posted on the ARRL Web page. An ARRL news article, dated today (May 21), has announced this posting. Here is a link to the article. We are hosting a test session on June 20 at 4 pm. It will be held at the Okmulgee County Emergency Operations Center, 110 N Alabama in Okmulgee. Walk-ins are welcome. All license classes will be offered. Everyone is welcome to test. All 3 test pools will be changing in July of this year. Oklahoma Governor Mary Fallin signed a proclamation making the week beginning June 21 as Amateur Radio Week in Oklahoma. Field Day closes out the week June 26-27 with many amateur radio clubs setting up Saturday and operating through noon Sunday. called "Field Day", announced officials with the American Radio Relay League. The Governor told Section Manager Lloyd Colston growing up in Tecumseh, Oklahoma, her father had a number of radios and scanners with which he monitored weather conditions in Central Oklahoma. The Governor said she is quite aware of the help radio amateurs in Oklahoma provide. She cited the recent severe weather Oklahomans have experienced in recent months including tornadoes and flooding resulting in requests for federal assistance for at least 40 of Oklahoma's 77 counties. For over 100 years, Amateur Radio — sometimes called ham radio — has allowed people from all walks of life to experiment with electronics and communications techniques, as well as provide a free public service to their communities during a disaster, all without needing a cell phone or the Internet. Field Day demonstrates ham radio's ability to work reliably under any conditions from almost any location and create an independent communications network. Over 45,000 people from thousands of locations participated in Field Day in 2014. "It's easy for anyone to pick up a computer or smartphone, connect to the Internet and communicate, with no knowledge of how the devices function or connect to each other," said Lloyd Colston, Oklahoma Section Manager of the American Radio Relay League, the national association for Amateur Radio. "But if there's an interruption of service or you're out of range of a cell tower, you have no way to communicate. Ham radio functions completely independent of the Internet or cell phone infrastructure, can interface with tablets or smartphones, and can be set up almost anywhere in minutes. That's the beauty of Amateur Radio during a communications outage." Amateur radio clubs in nearly every county in the state as well as clubs in the Oklahoma City and Tulsa will participate in Field Day. Also, some individuals have listed their Field Day operations. Thanks to Public Information Coordinator Michael Dean for this report. The W3JY NTS interview will air today on WTWW 9475 KHz 1 – 3pm CDT & Sunday on WTWW 5085 KHz 7 – 9pm CDT. It will also at that time be uploaded to our website http://qsoradioshow.com on our podcast page. The NTS has survived, since George Hart’s retirement, solely on the willpower and grit of its dedicated volunteers. We understand our network of networks – not to mention the skills that make them happen – cannot be allowed to pass away. They must be preserved at all costs no matter how unloved and unsexy they may be. They are the core of the ARRL mission and represent the totality of the Amateur Radio “value proposition” to the American public: relaying messages when they are needed most of all. Thing is, when all your effort goes into making it happen, there’s no time left to spread the word even among our own beloved League’s headquarters officials and staffers let alone the general public! We are laboring mightily to raise NTS’s presence and hope this interview with Ted Randall, to be broadcast worldwide on his QSO Radio Show this weekend, will help. Won’t you turn your dial to 5085 or 9475kHz this weekend? Who knows – maybe you’ll be inspired to send a few Radiograms yourself. The W3JY NTS interview will air this Saturday on WTWW 9475 KHz 1 – 3pm CDT & Sunday on WTWW 5085 KHz 7 – 9pm CDT. It will also at that time be uploaded to our website http://qsoradioshow.com on our podcast page. Show host Ted Randall, WB8PUM interviewed W3JY for two hours Monday evening about ham radio, the meaning of life, and the NTS. Ted is an enthusiastic supporter of the NTS mission and thinks we do not tell our story very well. I agree! So to help change that, he made WTWW and its 100,000 watts available to NTS. His program reaches an audience so vast it is hard for hams to conceptualize it. Apparently, a typical podcast version of his radio program is downloaded more than 100,000 times and anywhere from 600 to 1,000 emails from around the world come in response to any given program. And there’s the snail mail, too. Sacks of it. He offered to have me back on his show to delve deeper into the NTS, which he believes taps into something much deeper than a simple message platform, rather a kind of human community the Internet cannot simulate but which we need. This is a good week for the NTS! W5LHG, KC5FM, KD5NJR, WA5RDG, WX5ASA, AF5LW, KC5RBH-9, KA5WRG, KK4WZQ-10, KF5ZTX-5, KG5EWK, K5SJW, KF5YIW, KE5URG, KG5CQJ, KE5HPV, KC5WQX, KD5ISA-7, and AJ5W. The next statewide APRS net will be on Saturday, June 13th at 1 PM. Net control will be KC5SHE-2, Scott Mayes, located near Claremore, OK. In addition to standard messages and bulletins, Scott will be using the ANSRVR to send out requests for check ins and receive check ins. If you don't know how to use ANSRVR, check out the training materials at https://www.dropbox.com/s/rgvw6bokclb4ttj/APRS%20Messaging%20TDRC%20Training.pdf?dl=0. Scott will also be monitoring the DMR statewide OK group and the TARC UHF linked system for those stations that may not have APRS capability, but still want to participate. We continue to operate HF APRS using the instructions located at http://tulsadigitalradioclub.blogspot.com/2015/03/hf-aprs-fldigi-style-using-pskmfsketc.html . As an additional incentive for this upcoming net, a certicate of appreciation from the Tulsa Digital Radio Club (TRDC) will be sent to those stations that try this new high-tech wrinkle on the two decades old HF APRS mode. The HF APRS net will be running on 7036 kHz at a center frequency of 1000 Hz using MFSK-16 for highest robustness during the net. In an effort to raise awareness of earthquake preparedness, the Department of Homeland Security’s Federal Emergency Management Agency (FEMA) and the Ad Council have partnered with Warner Brothers to launch a new series of public service advertisements (PSA’s) featuring scenes from the action thriller San Andreas, starring Dwayne Johnson. The PSA’s educate audiences on the three steps to take if an earthquake strikes; “Drop, Cover and Hold On.” The PSA’s direct audiences to Ready.gov/Earthquake, where visitors can access more information on how to protect themselves, their families, and property before, during, and after an earthquake. For more information about the PSA’s, please read the full press release. During the Dayton Hamvention last week, A meeting for Section Managers was held at the Mariott Hotel on Edwin Moses Blvd. in Dayton on Friday May15. It was a two hour meeting and a Go To Webinar session was hosted to allow Section Managers not attending the Dayton Hamvention an opportunity to be included in the meeting as their schedules would allow. Speaking at the Meeting was Norm Fuzaro W3IZ ARRL HQ Clubs Coordinator, Steve Ewald WV1X ARRL Field Services Coordinator, and Jim Fenstermaker K9JF 2nd Vice President of the ARRL Board of Directors. He spoke to us about the ARRL Strategic Plan and some of the goals and needs for the ARRL going forward. He provided us with a survey and asked that we please complete it and return it to him at our earliest availability. He is to make his next report to the BOD in mid July. Please find attached a copy of the survey for you to complete and either send by snail mail or email to him not later than June 12. A copy of this survey has alredy been posted on the SM only portion of the ARRL website as well. At the time I'm writing this, H.R. 1301 has 64 co-sponsors, with a few more expected by the end of the week. That's excellent, but we need more. A lot more. Some of you have done e-mail bulletins encouraging members to meet with and write to their members of Congress. Thank you! Please repeat the message periodically. Although we don't want to spam members and irritate them, keeping the issue fresh in their minds is necessary. The ARRL's national media do stories about the bill, but the message needs reinforcement from someone whom members know personally. They know you. Please mention the bill when you speak at conventions and club meetings, too. Do you carry information about the bill when you visit these events? We have been told quite bluntly by some Congressional offices that they want letters from constituents, that they will be interested in what the ARRL has to say only if they know that voters care about this issue. Why should the Congressman care, they ask, if the voters don't? There are tens of thousands of ARRL members who have not written yet. You can do a lot to persuade them to write, because they know you. Why is this the best way? For one thing, we able to keep track of how many communications are going to which Congressional districts. More importantly, when letters are hand-delivered to the Hill, there's an opportunity to speak with Congressional office staff people. The stack of letters is proof that voters care about the bill. We have to convince the staff people, so they'll advise the Representative to co-sponsor. That's how it works on Capitol Hill. One more thing. When you see that a member of Congress in your Section has become a co-sponsor, urge your members to call or e-mail a message of appreciation. Good manners, good strategy. The list of co-sponsors is updated regularly at www.arrl.org/hr-1301 This is the URL that gives members the information they need in order to be effective advocates. We are working on having a companion bill introduced in the Senate, but there is nothing to report on that yet. Members often ask about this. Until we have a bill in the Senate, we do not need letters to members of that body. I have a Twitter feed, @KayCraigieN3KN, which I use only for advocacy about this legislation with the hashtag #hr1301. I'm not doing this as an ego trip to develop a personal fan club but rather to get information, encouragement, and reminders out there rapidly. When there is an amateur radio news story that I can reasonably tie to the issue of antenna privileges, I tweet about it and use the phrase "Can't do it without antennas." Please keep your Director well informed about your activities on behalf of the bill. This is a full-team effort. 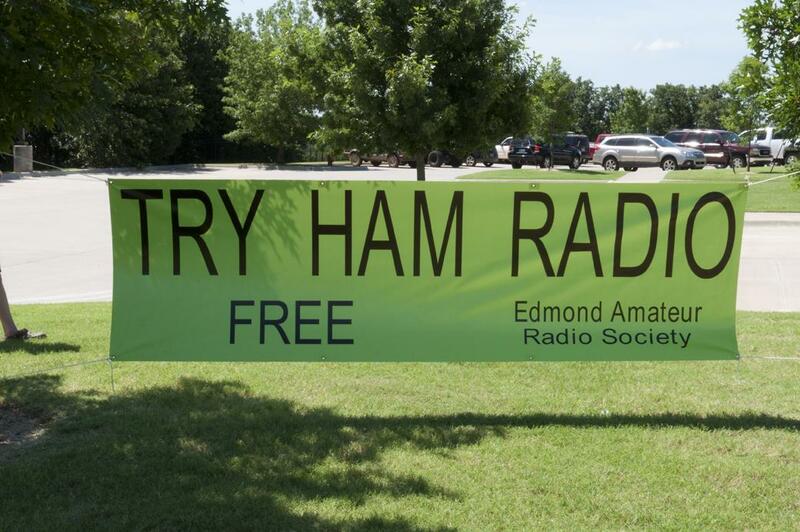 This weekend, there's activity in the Oklahoma Ham Nation! NO COVER CHARGE, NO PARKING FEE, ..
requires a P L tone - 100 hrtz. Don't forget the "Comanche Code Talkers of WWI & WWII" are on the air June 5 through 7. It is better to be informed than it is to be afraid. released May 21, it's a matter of simple economics. 2014 and estimated that it would collect nearly $246,100. longer incur these administrative costs that exceed the fee payments. regulatory fee prior to its official elimination. See more detail on the www.arrl.org web site. HamCom, Saturday, June 13th at 11:00 AM. Sumner, known as "Mr.
the league including its headquarters staff and official journal, QST. His presentation is entitled, "ARRL Today and Tomorrow". title of Chief Executive Officer in 2001. TM-D710G, 2M/440 Transceiver capable of APRS/TNC, GPS and ECHOLINK . That is a lot of "stuff" in one radio! Colinas Blvd, Irving, TX 75039. Telephone is 972-252-7476.
from 60 tables to more than 140 indoor, air conditioned tables. brochure available on the above web site. firm assisting the ARRL in Washington, DC. chance to learn what to do and what not to do from a professional. Assistant in the West Gulf Division. personalized Certificate of Completion, you must preregister. call sign and your mailing address. Completion immediately after the session. will be available at the Forum.